Noroozifar, M., Khorasani-Motlagh, M., Yavari, Z. (2013). Effect of Nano-TiO2 Particles on the Corrosion Behavior of Chromium-Based Coatings. International Journal of Nanoscience and Nanotechnology, 9(2), 85-94. M. Noroozifar; M. Khorasani-Motlagh; Z. Yavari. "Effect of Nano-TiO2 Particles on the Corrosion Behavior of Chromium-Based Coatings". 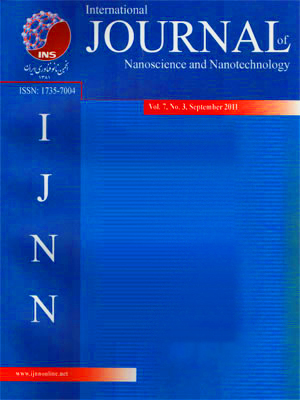 International Journal of Nanoscience and Nanotechnology, 9, 2, 2013, 85-94. Noroozifar, M., Khorasani-Motlagh, M., Yavari, Z. (2013). 'Effect of Nano-TiO2 Particles on the Corrosion Behavior of Chromium-Based Coatings', International Journal of Nanoscience and Nanotechnology, 9(2), pp. 85-94. Noroozifar, M., Khorasani-Motlagh, M., Yavari, Z. Effect of Nano-TiO2 Particles on the Corrosion Behavior of Chromium-Based Coatings. International Journal of Nanoscience and Nanotechnology, 2013; 9(2): 85-94. Nanosized TiO2 particles were prepared by sol–gel method. The TiO2 particles were co-deposited with chromium using electrodeposition technique. In investigating of coating surfaces by scanning electron microscope (SEM), the results showed that the morphology of the coating surface was changed by adding TiO2 nanoparticles to the chromium coating. The corrosion behavior of the coatings was assessed by polarization technique in four media such as seawater, pipeline water, distilled water and 3.5% NaCl solution. The results showed that adding the TiO2 nanoparticles into chromium coating, caused a decrease in current and rate of corrosion, and so increased the period of conservation from cupric undercoat.